The NY Times included quilt studies grad (M.A. 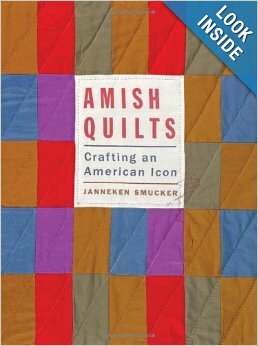 2003) Janneken Smucker’s new book Amish Quilts: Crafting an American Icon in its 2013 annual best books recommendations. In this in-depth study, illustrated with more than 100 stunning color photographs, Janneken Smucker discusses what makes an Amish quilt Amish. She examines the value of quilts to those who have made, bought, sold, exhibited, and preserved them and how that value changes as a quilt travels from Amish hands to marketplace to consumers. A fifth-generation Mennonite quiltmaker herself, Smucker traces the history of Amish quilts from their use in the late nineteenth century to their sale in the lucrative business practices of today. Through her own observations as well as oral histories, newspaper accounts, ephemera, and other archival sources, she seeks to understand how the term "Amish" became a style and what it means to both quiltmakers and consumers. She also looks at how quilts influence fashion and raises issues of authenticity of quilts in the marketplace.